NOTE: Date must be in the form YYYY-MM-DD, like 2019-01-11. He was a welder. He had an excellent sense of humor and was best known for his camaraderie. The laughter that he brought to those who knew him will be greatly missed. Doug Luttrell, of Russell Springs, departed this life on Thursday, January 10, 2019, at his residence, following a brave battle with cancer. He was 47. The funeral service will be held at 10amCT/11amET on Monday, January 14, 2019, at McKinney-Brown Funeral Home. Burial will follow in Birdie Russell Cemetery. The family will receive friends from 5-8pmET on Sunday, January 13, 2019, at McKinney-Brown Funeral Home. 2019-01-11 - Adair County Courthouse Annex, Columbia, KY - Photo by Tiffany Kessler, columbiamagazine.com. Officer installation at CCL #536 F.& A.M.
Casey Creek Lodge # 536 F.& A.M. will be having its annual installation of officers on Tuesday, January 22, 2019, at 7pmCT. It is an open installation (you don't have to be a Mason to see the installation). The installing officer will be James Gibson, the Grand Junior Warden for the Grand Lodge of Kentucky. We welcome all visitors, Masons and non-masons, to join us for this ceremony. Our lodge is located at 14730 Knifley Road, Casey Creek-Knifley, KY, at the intersection of 551 & 1472. If anyone wants more information, they can call me on my cell phone, 904-613-1400. Indictments brought against four individuals from Greensburg and Campbellsville, KY, on charges including assault, trafficking, possesion, and forgery. The Adair County Middle School Site-Based Decision Making Council will meet in regular session on Tuesday, January 15, 2019, at 3:30pmCT at Adair County Middle School, 322 General John Adair Dr, Columbia, KY.
Frankfort, KY - Kentucky Transportation Cabinet (KYTC) crews across the Commonwealth are pretreating roads today in advance of expected snow and freezing rain forecasted in parts of the state beginning Friday evening. "Our crews are proactively treating roads with brine to reduce travel impacts due to anticipated wintry weather," said KYTC Deputy Secretary Paul Looney. "District staff are keeping an eye to changing weather and road conditions and are ready to respond, as necessary, to maintain mobility and safety on state-maintained routes." The Lindsey Wilson men and women�s basketball teams head to Campbellsville, Kentucky for a Mid-South Conference doubleheader on Saturday at the Powell Athletic Center, 203 Tiger Way Campbellsville, KY. The women�s basketball team tips off at 1pmCT, followed by the men�s game at 3pmCT. Gaylon was a proud veteran who will be remembered widely for his influential career in education, both as a teacher and a principal. His love, wisdom and presence will be heavily missed by all who knew and loved him. Gaylon Delano Yarberry, age 74, passed from this life on Thursday, January 10, 2019 at Norton Health Care in Louisville after battling a short illness. Funeral services will be at NoonCT/1pmET on Monday, January 14, 2019, at the Church of the Nazarene, 912 W. Main St., Campbellsville, KY, with Bro. David Young officiating. Burial will be in the Fudge Cemetery in Breeding, KY.
Visitation will be on Sunday from 3pmCT/4pmET until 7pmCT/8pmET and then on Monday from 9amCT/10amET until NoonCT/1pmET at the church. International evangelist, speaker, and author Robby Dawkins will be at the Russell County Auditorium, 2167 US-127, Russell Springs, KY, this weekend January 11-12. The Friday evening session begins at 5pmCT. Saturday Sessions begin at 8amCT, 1:30pmCT, and 6:30pmCT. He will also be at the Russell Springs United Methodist Church, 206 Jamestown St, Russell Springs, KY, on Sunday, January 13, 2019, at 8:30AM. Please don't look the other way - please give a gift today to help those who are in danger of loosing, or have already lost, their homes in Adair County. As of January 8, 2019, J.O.Y. Ministries has raised over $12,000 of its $15,000 goal for our annual campaign. The campaign will end January 31, 2019 so there is still time to give! It was the amazing Christian man, William Wilberforce, who fought so hard for the abolition of slavery in the British Empire in the 1700s, who famously said, "You may choose to look the other way, but you can never say again that you did not know." The volunteers at J.O.Y. know . . . Every weekday, our volunteers come face to face with the poverty and addiction rampant in our community, but serve with a smile and a gracious heart. T.J. Regional Health, a premier healthcare provider in South Central Kentucky, would like to announce that Stacey Biggs has assumed the role of Executive Vice President of Marketing, Planning and Development. Biggs brings more than 20 years of strategic marketing, customer relations, communication, and event planning experience to T.J. Regional Health. Denzil R. Stephens, 80, of Yosemite, KY passed away on Friday January 4th at the Casey County Hospital. A Graveside Service will be held on Sunday, January 13th, 2019, at 2pmCT at the Bernard Cemetery, Jamestown, KY with Bro. Tony Stephens officiating. Georgetown, KY - The Lindsey Wilson men's basketball team fell to No. 9 ranked Georgetown (KY) Thursday evening at the Davis-Reid Alumni Gym by a final score of 73-69. The Tigers controlled the glass in the game as they out rebounded LWC 42-31 after grabbing 14 offensive rebounds that would lead to quality second chance points. Lindsey Wilson will be back in action when they hit the road this Saturday for a matchup against the No. 7 ranked Campbellsville University Tigers on Saturday, January 12, 2019 at 3pmCT at Powell Athletic Center, 203 Tiger Way Campbellsville, KY. He was retired from the Jefferson County Public Schools serving as Principal for Valley Elementary and Layne Elementary Schools. He was also a Veteran having served in the United States Army. Morris W. Ingram, 90, of Louisville, KY, passed away on Wednesday, January 9, 2019 at his home. The funeral services for Mr. Morris W. Ingram will be conducted at 1pmCT on Monday, January 14, 2019, at the Cowherd and Parrott Funeral Home, 206 South Main St., Greensburg, KY, with burial to follow in the Ladies Chapel Cemetery. Bro. William Davenport and Bro. Garnett W. Davis officiating. Visitation is requested after 10amCT on Monday, January 14, 2019, at the Cowherd and Parrott Funeral Home, until time of the funeral service. Frankfort, KY - Agriculture Commissioner Ryan Quarles invites Kentuckians to nominate a farmer or forester for the 2019 Kentucky Leopold Conservation Award. "The Leopold Conservation Award celebrates Kentucky farmers and foresters who go above and beyond in the care and management of natural resources," Commissioner Quarles said. "The nominees carry on Kentucky's proud tradition of conserving important resources while keeping their property productive and sustainable. The Kentucky Department of Agriculture is proud to be a part of this program." Sand County Foundation, the nation's leading voice for conservation of private land, presents the Leopold Conservation Award to private landowners in 14 states for extraordinary achievement in voluntary conservation. In Kentucky, the $10,000 award is presented with the Kentucky Agricultural Council and the Kentucky Association of Conservation Districts. The armored car driver who disappeared last month, reportedly with $850,000, has been charged with theft and awards totaling $60,000 have been offered for information leading to his arrest, Louisville police and the FBI announced Wednesday. The disclosure came a few hours after the Courier Journal reported Mark Espinosa, 29, was let go by GardaWorld within five days of his disappearance Dec. 5 from Louisville's Jefferson Mall. Authorities had previously declined to say if he was a victim of a theft or the perpetrator. But Wednesday the FBI said its joint investigation with police determined Espinosa was "directly involved in the theft." 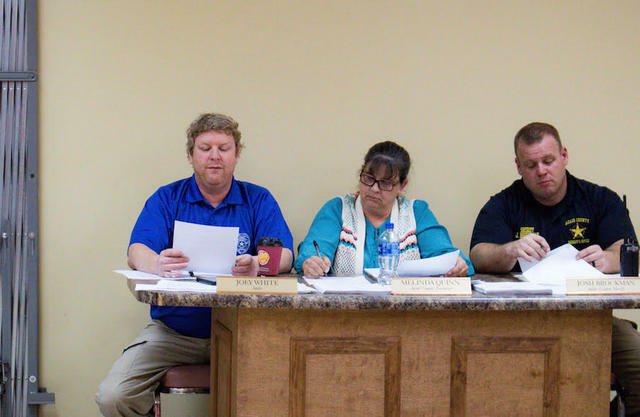 Adair County Judge Executive Gale Cowan presided over January's official fiscal court meeting on Tuesday evening, January 8, 2019. Judge Cowan was sworn in on Sunday afternoon and held a special called meeting the next morning in which most of her appointments were made. Tuesday's meeting took less than an hour and seemed to focus more on other departments within the county. Recalling the murder of two students at Marshall County last year and other shootings in the nation's schools, state Sen. Max Wise unveiled a comprehensive 30-page bill Wednesday intended to make Kentucky schools safer. Wise, R-Campbellsville, said the measure, Senate Bill 1, addresses "a pressing issue" that lawmakers can and must address. Senate Bill 1, the School Safety and Resiliency Act, is a product of a 16-member, bipartisan panel of senators and representatives. Georgetown, KY - The Lindsey Wilson women's basketball team continued Mid-South Conference play on Thursday night with a 66-52 road victory over Georgetown (Ky.) at Davis-Reid Alumni Gym. LWC shot 64.3 percent from the floor in the first half of action to build a commanding lead at the break as they were 18-of-28 from the field including 6-of-10 from beyond the arc. It's currently 21F at the Adair County Mesonet station. It will be increasingly cloudy today, with a high near 42F, and east wind 3 to 6 mph. Precipitation will move in tonight ahead of a slow moving low pressure system. Precipitation could start out as snow, or a mix of rain and snow, but will gradually transition to rain by sunrise Saturday morning. With surface temperatures hovering around or just above the freezing mark, snow accumulations are expected to be limited to an inch or less. However, the snow could create slippery road conditions, especially on untreated secondary roads. A chance of snow and freezing rain will remain before 7amCT on Saturday morning, then a chance of rain and snow between 7amCT and 9amCT, then rain likely after 9amCT. Cloudy, with a high near 42F. Southeast wind 6 to 8 mph. Chance of precipitation is 60%. Little accumulation of ice or snow is expected. Taylor County: 1 event Circuit Court. 15 events District Court. --Robert Stone, Friday, 11 January 2019.